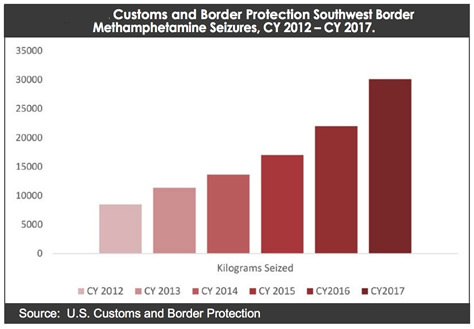 Methamphetamine laboratory seizures continue to decrease across the United States and are at the lowest level in 15 years. The passage of the Combat Methamphetamine Epidemic Act (CMEA) in 2006 reduced domestic methamphetamine production. Unfortunately, the methamphetamine produced in Mexico is a high purity, high potency, low cost alternative. Shortly after the passage of the CMEA, Mexico introduced similar legislation regarding precursors, notably pseudoephedrine. 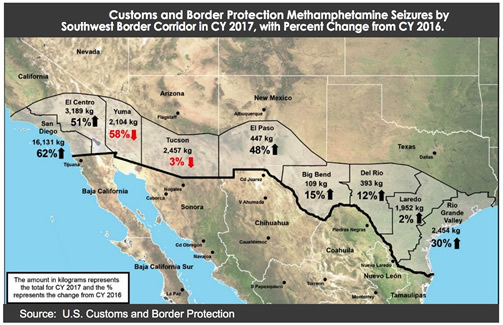 Most of the methamphetamine available in the United States is now produced in Mexico and smuggled across the southwest border (SWB). Though restrictions have been placed on precursor chemicals in Mexico, Mexican transnational criminal organizations (TCOs) continue to adapt by finding alternative methods of manufacture, with much of the precursor chemicals being sourced back to companies in China. Many of the domestic methamphetamine laboratories seized in 2017 were small capacity production laboratories, known as the “one-pot” or “shake and bake.” A laboratory of this size generally produces two ounces or less of methamphetamine per production cycle, making it small scale and easy to conceal. Common household items (i.e. pseudoephedrine/ ephedrine tablets, lithium batteries, camp fuel, starting fluid, and cold packs) are used as ingredients and mixed inside a container, such as a plastic soda bottle. This method produces small amounts of methamphetamine, and is very portable. “One pot” laboratories are often dangerous, and in many cases can cause fires, serious injuries, or even death. The number of domestic methamphetamine laboratories seized decreased nearly 78 percent from 2012 (13,657) to 2017 (3,036). In 2017, 81 percent of all methamphetamine laboratories seized in the United States were small laboratories capable of producing two ounces or less of methamphetamine. Methamphetamine is not usually sold and bought on the streets like many of the other known illicit drugs. Meth users report that they obtain their supplies of methamphetamine from friends and acquaintances. It is typically a more closed or hidden sale, prearranged by "networking" with those producing the drug. Often it is sold "by invitation only" at gatherings or "raves".